Due to the nature of uPVC, a variety of installation options are available. So if you’re interested in a uPVC door and frame with a double glazed surround, an arched frame and toplight or just the PVC door curved to fit your arch; we can fit them all. 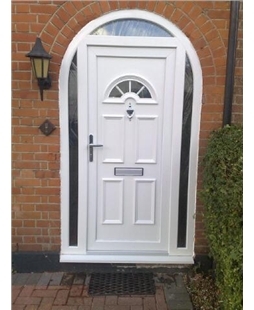 Any of the uPVC doors you find on this website can be installed into our arch frames. Combining the Gothic aesthetics of arches with low maintenance, cost effective thermally efficient uPVC doors, our arched uPVC door and frame selection will enhance your home’s natural beauty and add value to the property. Our arched uPVC doors all come with toughened double glazed units, keeping your home warm and safe. To find out more about the various options we have, please click on the 'read more' tab just below. 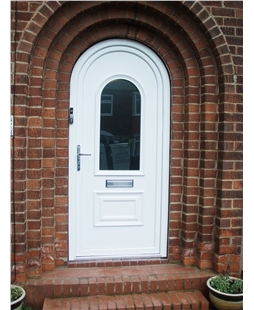 uPVC doors can be rounded at the top to fit snugly into an arch without the need for a toplight, like composite doors. 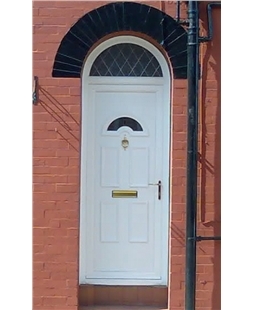 Absolutely any uPVC door you find on our website can be amended to fit into an arch frame, contact us today to find out more. Toplights are a beautiful addition to any door as they help to illuminate your hallway with natural light and offer another opportunity to personalise your front door; creating a truly bespoke design. Any uPVC door on our site is suitable for this layout, please get in touch to find out more.